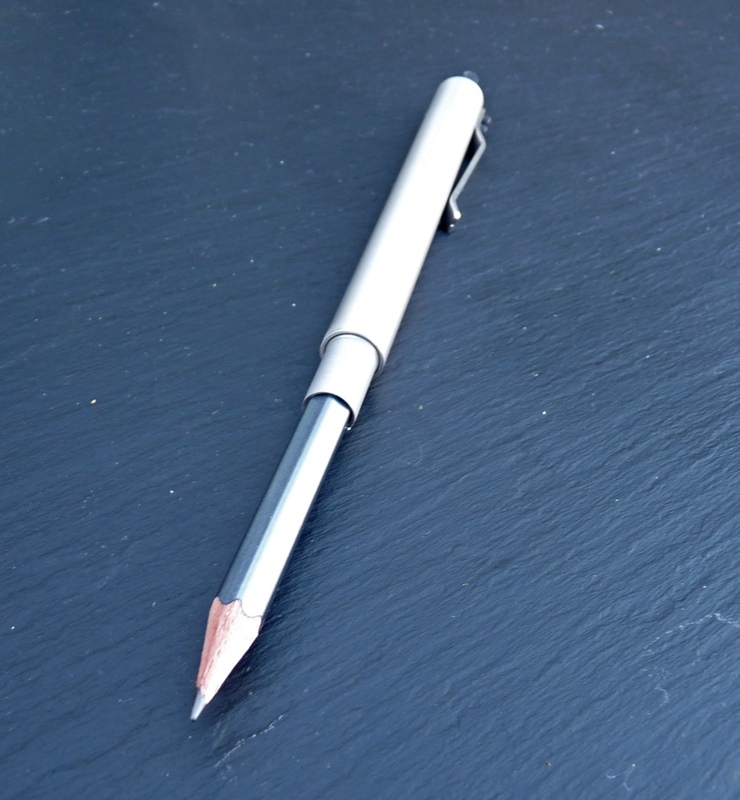 Bullet Pencil TT Review – Pens! Paper! Pencils! 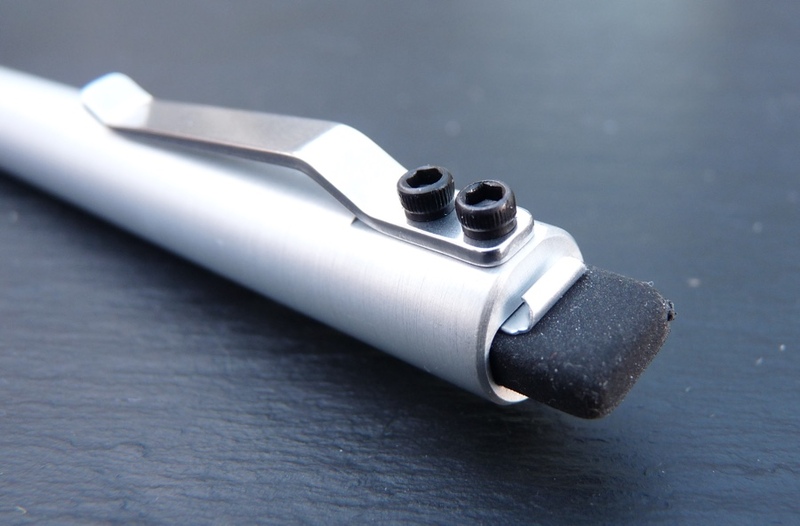 The Bullet Pencil TT is an aluminium pencil holder made by T. W. Grant & Sons. 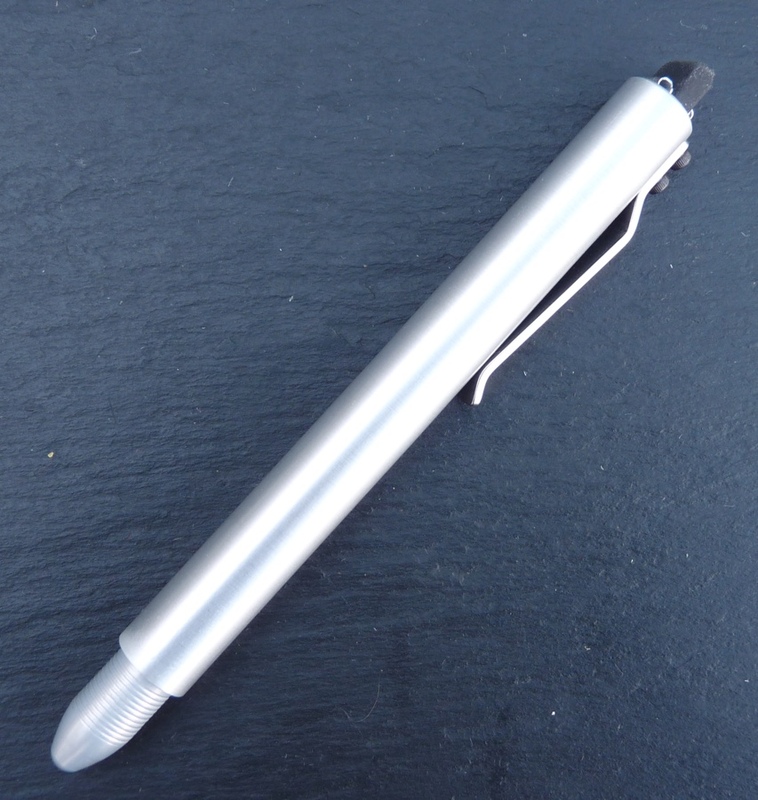 It’s available with a stylus tip (the ST model, costing $39) and without (this model, the TT, costing $35). It was originally a Kickstarter project which delivered on time. The TT comes in two parts. A short tip holds the stub of a wooden pencil securely in place. This is the part that ends in a stylus if you choose the ST model. Any standard sized pencil will do – a couple of Palomino Blackwing stubs are included. It’s a good system. The larger part is the barrel. The idea of a bullet pencil is that the pencil is stored inside the barrel to protect the tip (and your pockets) while it’s being carried. It’s then pulled out, turned around and pushed back in to make a long pencil. The barrel has a strong steel clip. It doesn’t have a lot of flex and so is perfect if what you want to clip onto is the right size but otherwise may cause problems. I’ve found the same issue with several other metal pens. 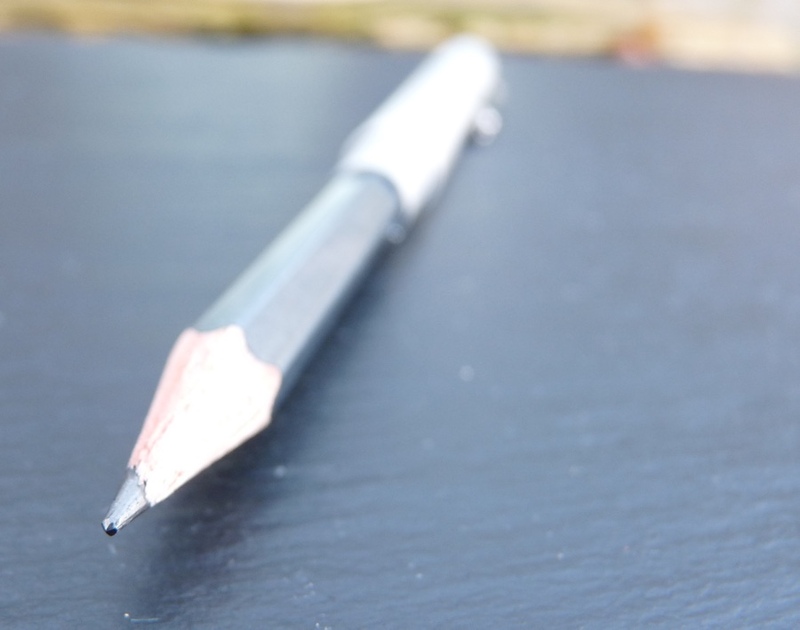 A rather clever bit of design means that the TT holds a Blackwing eraser at its tip. This is a good move in that replacements are easy to find, although sadly Blackwing erasers aren’t the best. In use, the balance of the pencil is a little off. It’s quite top heavy which throws me every time I pick it up. I soon get used to it and stop noticing. However I’ve got big hands: if you have smaller hands it might be fatiguing with long use or just plain awkward to hold at all. 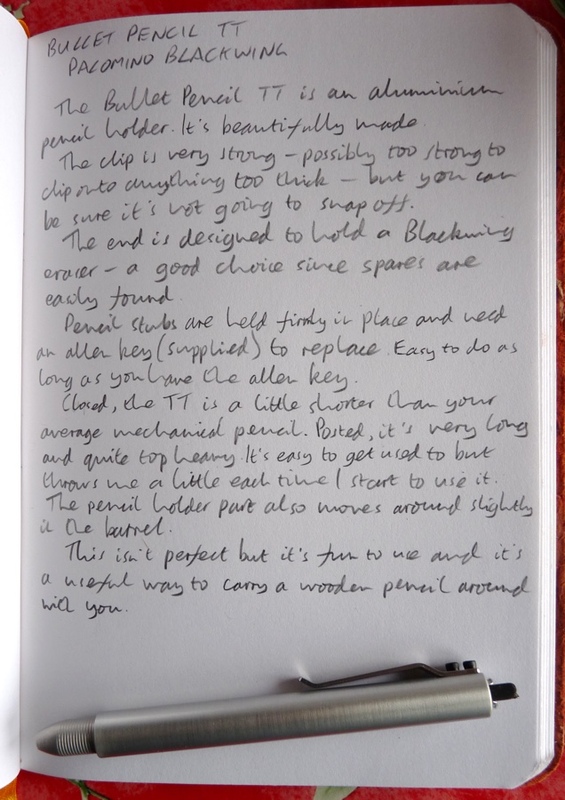 (Todd over at That One Pen just didn’t get on with this at all and I can understand why.) I also find the pencil holder section wobbles slightly in the barrel which is quite irritating. 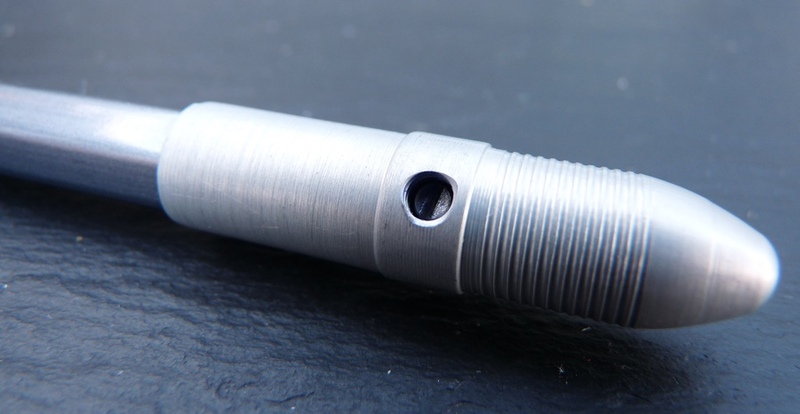 The Bullet Pencil TT is very well made although, on mine, the end of the barrel isn’t finished neatly. Apart from that, the standard is very high. This pencil holder isn’t perfect but it’s a reasonable price and it will last a lifetime. It makes your favourite wooden pencil easily pocket- or bag-able. It’s a good honest piece of engineering that, despite being made from modern materials using modern techniques, compliments the traditional pencil in a very interesting way. EDIT 21 January 2015: Jeff pointed out an error my description of how the pencil stub was held in place, which I’ve now changed. I can see the balance being less of a problem if you hold the pencil further away from the point, although the barrel wobble might then become more of an issue. Personally, I like the look, and idea of this. However, in application, I reckon Faber Castell’s perfect pencil (either the “Junior” version, or the 9000 version for me) seems a better solution to carrying pencils around, and regular pencil extenders (Derwent &c) a better way to eke the last bit of utility from pricey, or well loved pencils. One small correction, the Allen wrench that is included is used to remove the clip if desired, this lightens the barrel. There is no need to remove the ball plunger screw to replace the pencil. 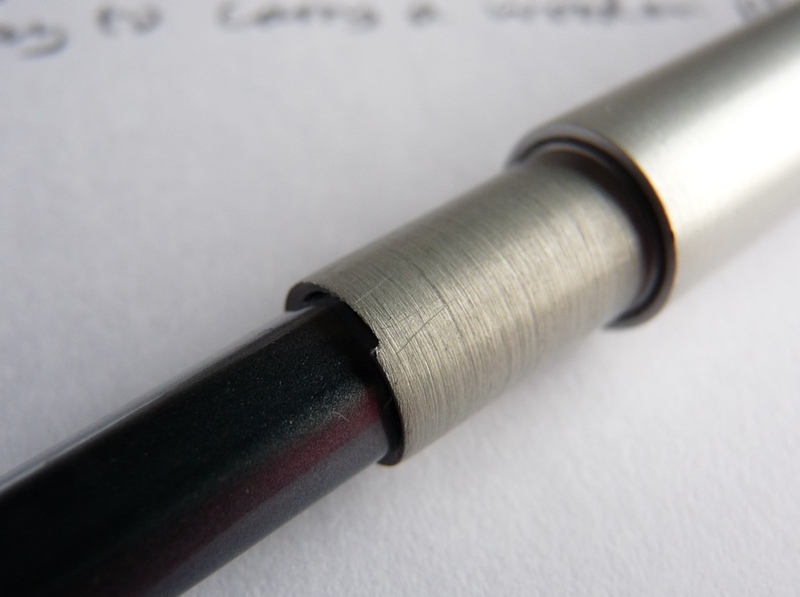 The pencil fits into a threaded groove in the bullet so simply twist out /in the pencil. Thanks Jeff. I’ve changed the article to reflect your corrections.